Fishere’s novel is a gripping portrait of the tenuous spaces that marginalized populations are made to occupy. 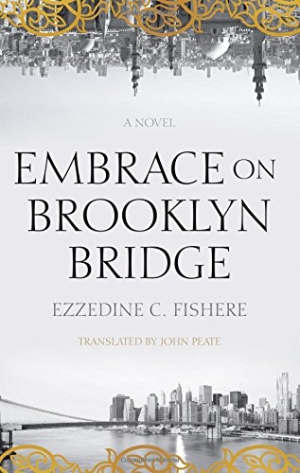 Ezzedine C. Fishere’s Embrace on the Brooklyn Bridge traverses the memories and inner struggles of a group of Egyptian immigrants in New York, resulting in a moving examination of the burdens of multiculturalism. Darwish, a lauded professor whose accolades in academia have never quite been matched by the respect he finds at home, sits in his study anticipating that night’s birthday party for his granddaughter, Salma. Darwish has high hopes for the girl, whom he wants to entice back to the West. He’s also sitting on a bombshell of a personal diagnosis. As he contemplates his swiftly narrowing future, sorting through books that serve as a road map, he also recalls the events that left him in an underused library, waiting and alone. The narrative shifts to include the perspectives of other expected party guests, from Darwish’s son, Youssef, who is haunted by events that he witnessed while working for the UN, to those of a former student who lost everything to false suspicions related to his origins in the Arab world. Some of these characters present as proudly westernized; others struggle to reconcile their origins with their current situations. The men of the story fall in and out of love with Christian women, battling for an always elusive middle ground; one disenchanted figure fosters resentment at Ground Zero, hating the nation that—even in the peripheral understandings of the most assimilated of the cast—never quite makes adequate room for the Muslims in its midst. Fishere’s method movingly teases out the spaces between belonging and forced, awkward fits, and the result is certain to endure in the reader’s consciousness, particularly thanks to the unresolved violence of final scenes. Fishere’s novel is Mrs. Dalloway for an age when conversations about immigration, particularly from Arab nations, dominate—a gripping portrait of the tenuous spaces that marginalized populations are made to occupy, and a searing examination of the struggle to belong.